Torture is perhaps the most unequivocally banned practice in the world today. Yet within six weeks after September 11, articles began appearing suggesting that torture might be "required" in order to interrogate suspected terrorists about future possibilities of violence. The United States and some of its allies are using methods of questioning relating to the war on terrorism that could be described as torture or, at the very least, as inhuman and degrading. It isknown that the United States sent some suspected terrorists to allied countries that are well known to engage in torture. And in terror's wake, the use of such methods, at least under some conditions, has gained some prominent defenders. 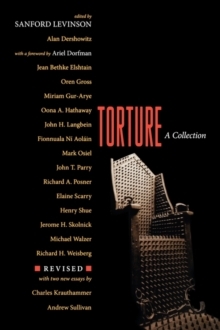 Torture: A Collection brings together leading lawyers, political theorists, social scientists, and public intellectuals to debate the advisability of maintaining the absolute ban on torture and to reflect on what it says about our societies if we do-or do not-adhere to it in all circumstances. One important question is how we define torture at all. Are "cruel and inhumane" practices that result in profound physical or mental discomfort tolerable so long as they do not meet somedefinition of "torture"? And how much "transparency" do we really want with regard to interrogation practices? Is "don't ask, don't tell" an acceptable response to those who concern themselves about these practices? Addressing these questions and more, this book tackles one of the most controversial issues thatwe face today. The noted contributors include Ariel Dorfman, Elaine Scarry, Alan Dershowitz, Judge Richard Posner, Michael Walzer, Jean Bethke Elshtain, and other lawyers from both the United States and abroad. Pages: 352 pages, 1 line illus.